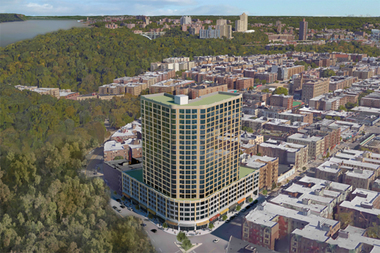 A rendering of the 23-story building proposed for 4650 Broadway in Inwood. INWOOD — Dozens of residents attended a public hearing to vote down an application for a proposed 23-story mixed-use apartment building on Sherman Avenue and Broadway — the first individual project to be proposed under Mayor Bill de Blasio’s controversial neighborhood rezoning plan. The application, presented last week by developer Washington Square Partners, seeks to rezone the project site at 4650 Broadway to allow for a building that’s taller than what's currently allowed in order to provide more affordable units, managing partner Paul Travis said. The developer can only construct an 18-story building under the current zoning that would include all market-rate housing, Travis said. However, the 23-story private development would include 335 rent-stabilized apartments — 112 of which would be affordable to people making 80 percent of the Area Median Income (AMI) of $62,150 per year for a family of three — as well as 159 parking spaces. The ground floor of the development would be designated for retail and office space, though Travis did not specify whether the commercial space would be rented at a reduced rate to local businesses. He did say they "anticipate primarily local, neighborhood businesses" will occupy the space. This plan is one of the options available to developers under the Mayor's Mandatory Inclusionary Housing (MIH) plan, which is currently with the City Council pending a final review and approval. If the MIH plan does not pass, Travis said the stakeholders would go back to the drawing board. Nonetheless, locals said they didn't agree with the height of the building because it “overpopulates” an already dense community and also displaces many families struggling with the increasing rents and the loss of rent-stabilized housing, longtime resident David Friend said. Friend, along with dozens of other residents in attendance and seven members of Community Board 12's Land Use Committee, ultimately voted in opposition to the proposed rezoning. No one came out in favor of the plan, while one person abstained and several attendees declined to vote. Councilman Ydanis Rodriguez, who has been advocating for a separate rezoning plan in Inwood, said during the hearing that he would only support the application if it allocated 50 percent affordable units for Washington Heights and Inwood residents earning $37,000 per year for a family of four. The meeting tally will ultimately be included in a resolution written by the Land Use Committee to be voted on by the full community board. "This is the first step in a multi-step process," said committee chairman Wayne Benjamin. "We need to be mindful. We need to make sure we're speaking [City Planning's] language." The application will go before the City Council in the coming months, after being reviewed by the Manhattan Borough President's office and the City Planning Commission. The board will present and vote on the final resolution during CB12’s full board meeting on Tuesday, March 22, at 7 p.m. at the Alianza Triangle Building, 530 W. 166th St.